Road trip planning is just the beginning of the fun! Most people go online when planning a vacation. I still like to go “old school”. 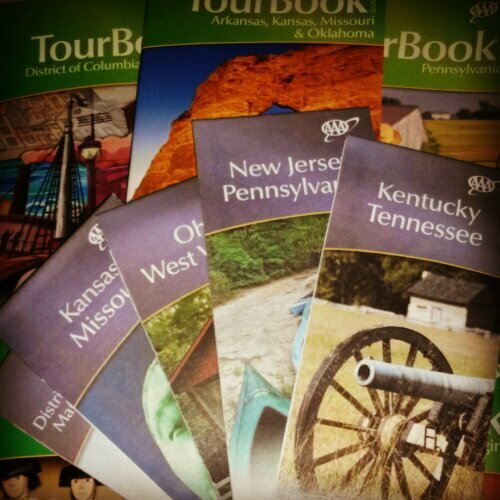 One of my favorite benefits of my AAA membership is free guidebooks and maps. Must do attractions, hotel recommendations, area maps, itineraries, local transit and parking info, tours, updated prices, etc. All that and all kinds of discounts too. I don’t like to over-plan my vacations. I do like to know what my options are. I always try to find some tacky tourist attractions. I also like to eat typical food for the city. For example, you can’t go to Chicago without have deep dish pizza or got to Pittsburgh without having a sandwich at Primante Bros. I hate coming back from a city and having everyone asking me if I did xyz and I had no idea that was a must do. A little research can go a long way to improve your experience. Just make sure you plan to be spontaneous and silly! Go to new places and experience new things! I LOVE road trip planning and just posted a very similar picture to this one a couple weeks ago- AAA has some great benefits for sure! Hope your planning goes well! Thanks! Looking forward to my first real vacation in ages!